CES 2018: Acer launches Chromebook 11 (CB311-8HT / CB311-8H) with 11.6-inch display and 4GB RAM. Acer today introduced its new Chromebook 11 (CB311-8HT / CB311-8H) line that offers strong everyday performance and a portable design with all-day battery life of up to 10 hours. The new Acer Chromebook 11 offers an 11.6-inch display in a portable and fanless design. The Acer Chromebook 11 has an 11.6-inch IPS display available in either touch (CB311-8HT) or non-touch (CB311-8H) models with 1366x768 resolution. The high-dynamic range (HDR) camera on the Chromebook 11 produces clear and brighter photos as well as video. The dual stereo speakers and integrated microphone enhance the webcam experience with high-quality audio. Users can also enjoy multiple apps and tabs at the same time on the Acer Chromebook 11, since it delivers strong performance with the latest Intel Celeron processors. The Acer Chromebook 11 comes with 4GB of memory and 16GB or 32GB of eMMC storage. The device's fanless design allows it to run quietly. 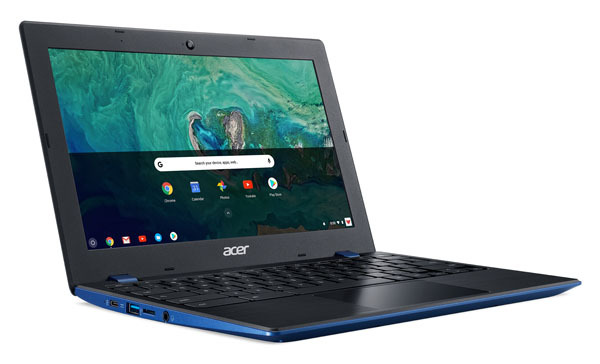 The new Acer Chromebook 11 device includes two USB 3.1 Type-C Gen 1 ports, which can be used to charge the device as well as other products, transfer data quickly and connect to an HD display. Plus, users can use the MicroSD card reader to access and transfer content. The Acer Chromebook 11 also includes two USB 3.0 ports and Bluetooth 4.2. Customers can stay connected to their network with fast and reliable 2x2 MIMO 802.11ac Wi-Fi wireless connectivity. The Acer Chromebook 11 provides easy access to the Google ecosystem including Google Drive, Gmail, and a variety of useful Chrome apps and extensions. Also, the Acer Chromebook 11 will fully support Google Play at launch, so customers will have access to millions of Android apps on Google Play. Chrome OS provides additional security since it's automatically updated to guard against ever-changing online threats. The new Acer Chromebook 11 provides up to 10 hours of battery life on a single charge.